Speed harmonization is a method to reduce congestion and improve traffic performance. This method is applied at points where lanes merge and form bottlenecks, the greatest cause of congestion nationwide. The strategy involves gradually lowering speeds before a heavily congested area in order to reduce the stop-and-go traffic that contributes to frustration and crashes. Speed harmonization has the potential to smooth traffic, increase the number of vehicles that a roadway can handle, and improve safety by making it easier for drivers to change lanes when necessary. It also has the potential to reduce the number of rear-end crashes caused by drivers who do not brake early enough when they encounter slow-moving or stopped vehicles. Mobile traffic sensors send real-time conditions at a congested location to a traffic management center. A computer uses this information to calculate optimal speeds for vehicles approaching the congestion and sends the speeds to connected vehicles on the road via wireless communications. The drivers receive the recommended speeds and can adjust accordingly, or, in an automated vehicle, the vehicle could adjust to the recommended speed automatically. 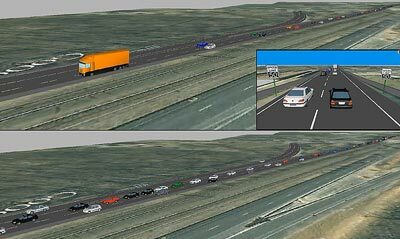 The Federal Highway Administration (FHWA) funded a project that used computer modeling to evaluate the effects of a large-scale deployment of speed harmonization. The computer modeled vehicles and roads in a way that replicated conditions on Interstate 66 (I-66) in northern Virginia during evening rush hour. Modeling results showed that speeds ranged from 0 to approximately 44 miles per hour (mph) approaching a congested location during a normal day. The same model showed speeds of 28 to 63 mph if only 20 percent of the cars travelled at speeds recommended by a speed harmonization algorithm. Based on these promising results, FHWA, in cooperation with the Virginia Department of Transportation, sponsored a real-world test of speed harmonization on I-66. During the test, three research vehicles equipped with infrastructure-to-vehicle communications received recommended speeds in live traffic on I-66. The speeds were generated and transmitted by a computer located at FHWA’s Turner-Fairbank Highway Research Center (TFHRC). The vehicles were equipped with cooperative adaptive cruise control to automatically adjust to the speeds recommended by the computer. The recommended speeds were updated every 2 seconds as the vehicles continuously sent their speed and location information back to TFHRC. The results of the field test will be published in 2015.
conditions with 20 percent speed harmonization compliance (top).